Barbeque Smokers and Grills Archives - A & J Time Rentals, Inc.
We have a total of five tow able BBQ smokers for rent and a tow able Gas BBQ Grill. You can cook a lot of meat on these grills as they are very large. These barbecue and gas barbecue grills are perfect for large parties. We provide the propane for you as well. You just pay for however much propane you use. 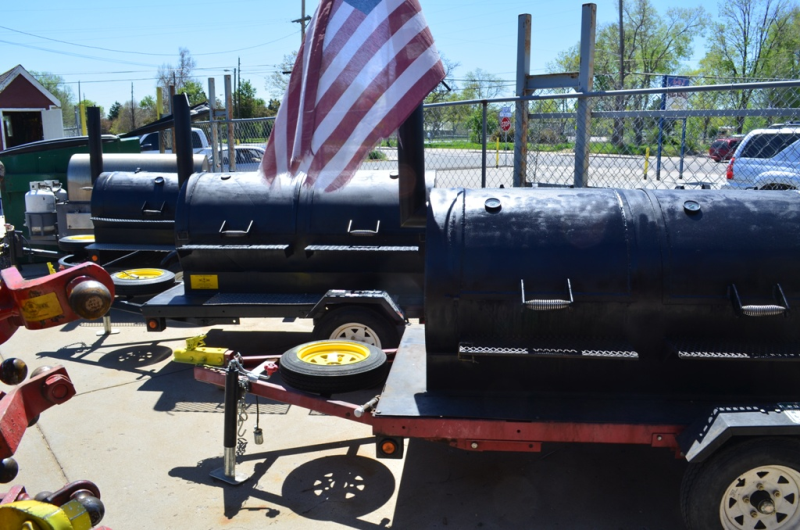 Plenty of barbecue chefs love Barbeque smokers. Smokers use lower heat and longer cooking times to cook meat. Chef’s who loves smokers say that smokers cook meat that has more flavor and is more tender. Meat is typically left in smokers for hours, and is coated with a rub or sauces before being cooked. The temperature in a smoker usually ranges from 175 degrees Fahrenheit to 225 degrees Fahrenheit. Smokers are typically large barrel-shaped cookers. A smoker has racks that you cook the meat on. The smoker is filled with charcoal or wood. Usually the main fuel is covered with a layer of damp wood chips. Wood chips produce most of the flavorful smoke that cooks the barbecue. Chefs say hickory, maple and cherry wood chips give the meat different flavors. The fuel is located in a different area than the meat. The smoke from the fuel is filtered into the smoker compartment so the meat receives indirect heat while cooking. Barbecue smokers produce tender, flavorful meat because of this process. The low temperatures allow the meat to cook slowly. The smoke is what is cooking the food and the meat absorbs the smoke as it cooks. The smoke is what gives barbecued meat its extra flavor. Bobcat has a new compact track loader: the "T550"
Copyright © 2019 AJ Time Rentals. All rights reserved.